In a large non-stick dutch oven, saute the onions in olive oil for 5 minutes, or until softened. Add the cabbage, sprinkle with salt, and continue to saute for at least 5 minutes, stirring occasionally. Add the bell pepper, coriander, turmeric, cinnamon, and cayenne to the pot and saute for another minute for so. Stir in the tomatoes, chick peas, and currents or raisins, and simmer, covered, for about 15 minutes, until the vegetables are just tender. Add the lemon juice and salt to taste. 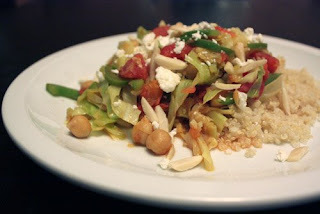 Serve over couscous, top with crumbled feta cheese, and toasted almonds if you like.